When the set of devastating tornadoes struck Oklahoma not too long ago, I sent out an email to my coworkers directing them to four reputable organizations they could donate through (on the advice of this article). These included the American Red Cross, the Salvation Army (though if I’d known this then, I probably would have left them out), Operation USA, and the Oklahoma Baptist Disaster Relief. I personally donated through the Foundation Beyond Belief because I had been alerted to the fund earlier that morning via the Richard Dawkins Foundation. This comment was rightly ridiculed by representatives of the many thousands of secular humanists who had donated their time and money to disaster relief in Oklahoma, and elsewhere around the country both in the recent and distant past. Dale McGowan, executive director of the Foundation Beyond Belief, has written a marvelous response to Joe Klein in the Washington Post, which you can read here. But what I found most telling was something in the comment section of McGowan’s article. 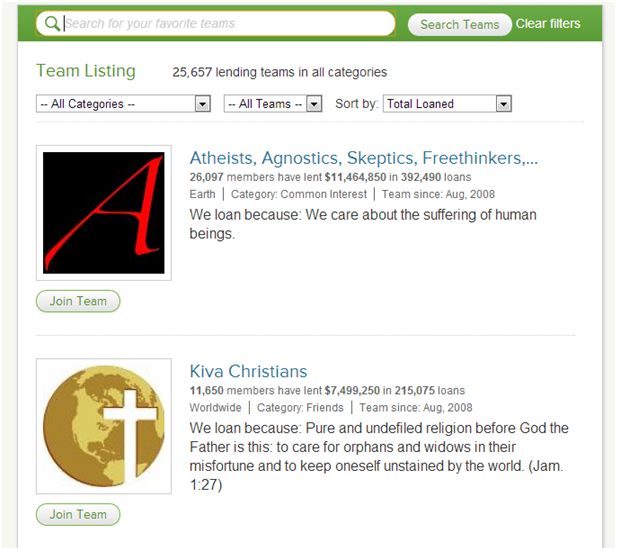 A user casually pointed out the current team giving standings on Kiva, the popular micro-lending site. Atheists, Agnostics, Skeptics, and Freethinkers are by far the most generous lenders, currently outpacing “Kiva Christians” by approximately $4 million. Come on, Christians, are you perhaps forgetting Matthew 19:21 (or am I overlooking a conflict with Exodus 22:25…it’s difficult to keep these straight, no?)? If you are someone who needs God to be a good person, that’s terrific – just don’t go around assuming everyone else does too.